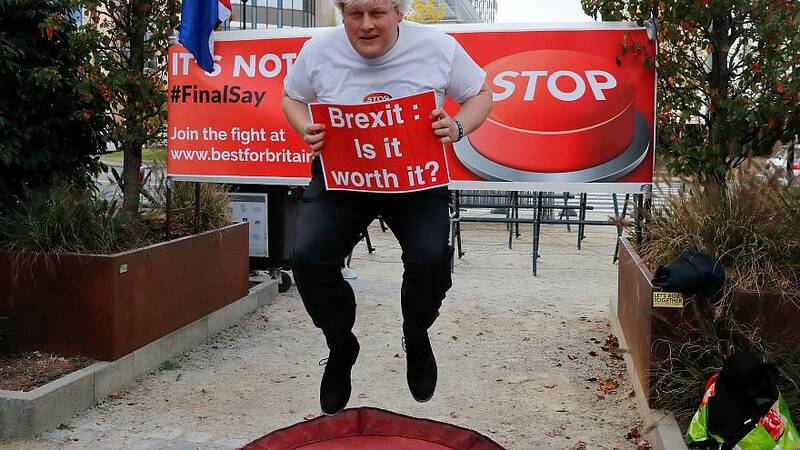 As EU leaders gather for what has been coined their moment of truth summit on Brexit, dozens of 'remainers' including a Boris Johnson impersonator jump and shout to try to stop it… Among them, Labour MEP Seb Dance. "Throughout this whole process, I have seen nothing but complete obfuscation when it comes to the real core inconsistencies of Brexit from the PM, things like for example idea we can have all the benefits, we can have frictionless trade, but we just don’t want to follow any of the rules. That we don’t need to put up a border in Ireland because we don’t want to, nonsense like this that doesn’t stand up to any scrutiny when you look at the facts." But the Labour MEP admits that his political party don’t have all the answers either. "We are not talking complete sense on this either…. We say we want to have a customs union and a say in future trade deals…. It is not clear to me why on earth would EU agree to a third country having its own say on his own trade deals." A topic that will come up among the EU27 after Theresa Mays 30 minute intervention. "I suspect she will use this half hour to plead for some movement on the EU position. Of course, we know the EU27 position has been consistent from the start and I see no reason why they would at this stage…who knows a half hour is a long time in politics so anything can happen."